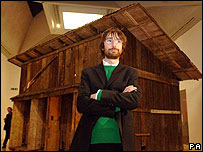 Simon Starling, the artist whose work includes turning a shed into a working boat and then back into a shed, has won the £25,000 Turner Prize. Starling, who said he felt "lucky" to win, beat painter Gillian Carnegie, installation artist Jim Lambie and video artist Darren Almond. He said being "a very lucky artist" included finding the shed for his artwork "with a paddle on the side". Culture Minister David Lammy gave him his prize at London's Tate Britain. The award, which began in 1984, is given to a British artist aged under 50 "for an outstanding exhibition or other presentation of their work". Starling, 38, said he was "a bit flabbergasted to win", and added: "I feel doubly lucky today - I had to wrestle this prize away from Gillian Carnegie, Jim Lambie and Darren Almond who I have the utmost respect for." Speaking about his artwork, Shedboatshed (Mobile Architecture No 2), he said he did not like to be thought of as eccentric because "that's not what my work is about. It's a serious business on many levels". "It's about slowing things down, about trying to retard this incredible speed at which we live." The artist recycles objects, reframing and reforming them for his installations. Born in Epsom, Surrey, Starling studied at Trent Polytechnic in Nottingham and Glasgow School of Art. He lives and works in Berlin and Glasgow. He found his shed - a wooden shack - in the Swiss town of Schweizerhalle. After turning it into a boat, he paddled it seven miles down the Rhine to Basel, where he rebuilt it. Another artwork, Tabernas Desert Run 2004, saw him cross the Spanish desert on an electric bicycle he built himself. 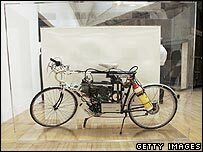 He then used the waste water produced by the bicycle to produce an accompanying cactus painting. The artist describes his work as "the physical manifestation of a thought process". Tate director Sir Nicholas Serota said the prize has always enjoyed controversy, and that it "confronts us with the most challenging art of the day". He thanked the artists for "such an impressive exhibition", adding that all four artists would be receiving prize money this year, due to increased sponsorship. The runners-up each received £5,000. And Sir Nicholas added that former Turner Prize winner Chris Ofili was stepping down as a trustee of the Tate Gallery. Jeremy Deller won last year's prize for his film about US President George Bush's home town in Texas. Memory Bucket was a documentary exploring Crawford, Texas, and the Branch Davidian siege in nearby Waco. Other previous winners include Rachel Whiteread, Gilbert and George, Anish Kapoor, Antony Gormley and Damien Hirst.